With the games in Sochi underway, people around the world are tuned in to watch the competition heat up in their favorite cold-weather sports, including cross-country skiing, snowboarding and hockey. Back in Washington, we watched Ben Bernanke officially “pass the puck” to Janet Yellen, who became the new chairman of the Federal Reserve’s Board of Governors last week. Imagine if the puck were the Fed’s assets—that would mean the disk is five times bigger today than when Bernanke became chairman in 2006. At the beginning of his reign, the Fed’s assets were $834.6 billion. Now, the balance sheet has grown to $4.1 trillion, a previously inconceivable size. Until last year destroyed gold’s multi-year bull reign, the expansion of the U.S. balance sheet and the price of gold over the past decade moved in near lockstep. 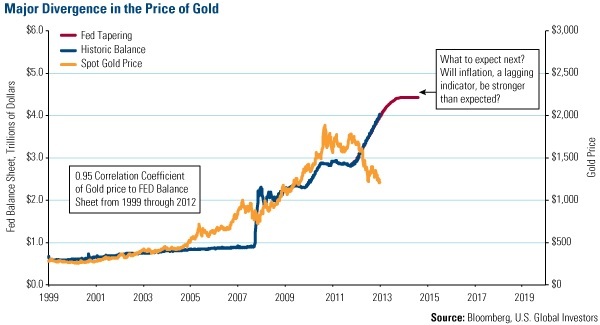 From 1999 through 2012, the correlation coefficient of the rising price of gold to the Fed’s climbing assets was 0.95. Even with the tapering of the bond purchases that began in late 2013, the Fed’s balance sheet remains on an upward trajectory and much higher than the price of gold. This suggests we should see much higher prices. 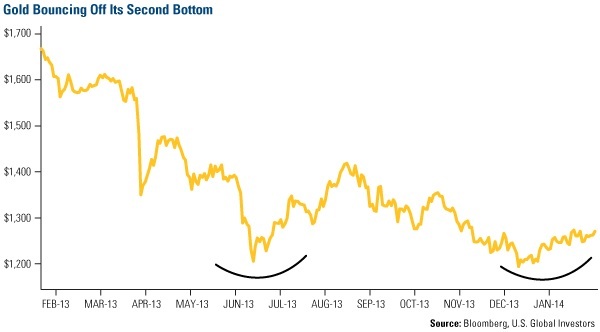 What will break gold of its losing streak? Will inflation, which is a lagging indicator, be stronger than expected? In one of my most popular posts last year, I said that based on the jobs market, the limited housing recovery and regulations slowing down the flow of money, the Fed would have no choice but to start tapering and raising rates very gradually to keep stimulating the economy. Read the Fire Fueling Gold. There’s also a weaker demand in mortgages in the past quarter. According to a survey of banks, nearly 30 percent reported weaker demand for prime mortgages, which is the “worst data since April 2011,” says CLSA. About 46 percent of banks are seeing weaker demand for non-traditional residential mortgages, the worst since January 2009. The ISM manufacturing new orders index is also off. In January, new orders fell from 64.4 in December to 51.2 in January, which was the largest monthly decline since December 1980. So even if investors shrugged off the latest disappointing jobs report, we’re pretty certain the incoming chairman is paying close attention to the scoreboard.